1. What is a From Existing rule? 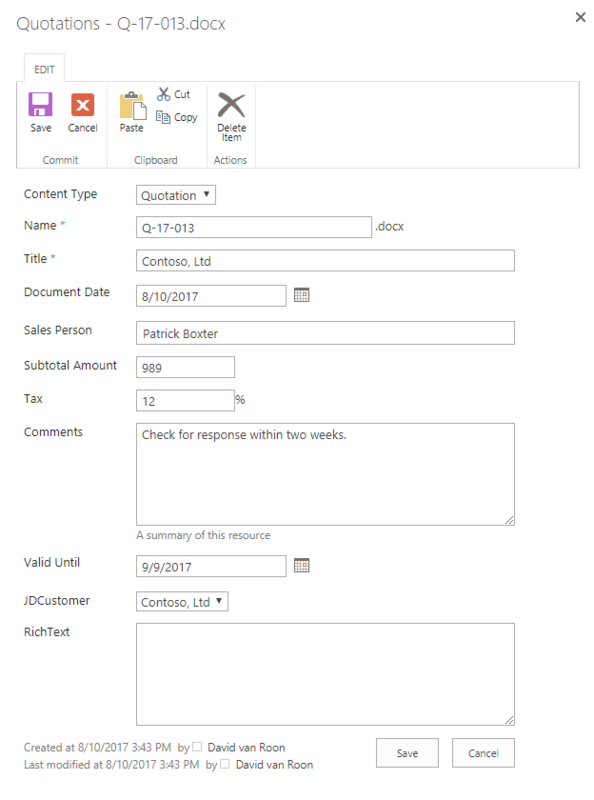 From Existing rules let you use the metadata of a selected list item to create a new document or list item in JungleDocs for SharePoint. In other words, a From existing rule is a command to create a specific document or list item by using the data present in a specific list or document(s). An example of a From existing rule would be Create a quotation. Navigate to the From Existing tab in JungleDocs. To add a From Existing rule click New From existing rule. A new window will now open, prompting the user to configure the new rule. Also, select the Base rule you want to use for this rule. It will take the configuration from this rule. Here you will select the document template that, when running the rule, will be filled with Small Parts to create a new and unique document. Either select the document template that is assigned to the base rule template, or upload one that you created specifically for this rule. Decide what column values you want to be copied into the new document. Here you can merge the data from different columns for your new file or use mail merge to create new data. 5. Once you have configured your new From existing rule, click OK to save it. You are now done and can select the new rule from the From existing tab in JungleDocs. Navigate to the library or list where you want to create your new documents/list items. Select the documents/list items you want to use data from to create your new list items/documents. 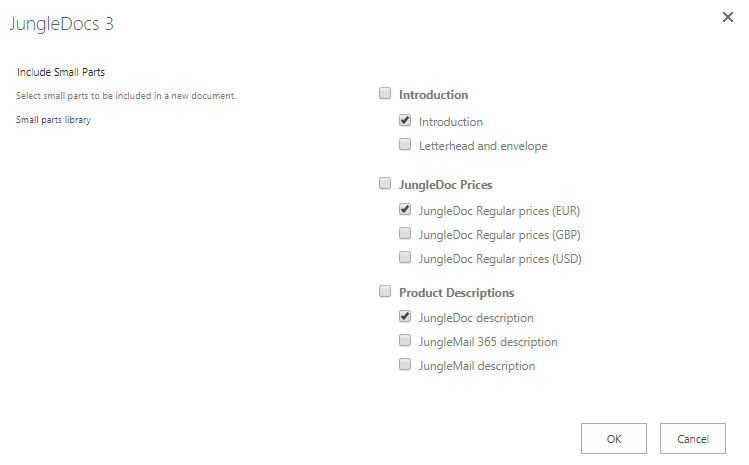 Select JungleDocs from the ribbon. Click on the required From existing rule to run it. This will prompt a new window to open. Select the parts you want to be included in your document and click OK.
A new window will open. This window contains the information for the document, its name, and any additional notes. Most of the fields will have been filled in by JungleDocs already, as pre-configured in the rule. Click Save and the new document will be generated and stored on your SharePoint (or downloaded, depending on the rule settings).